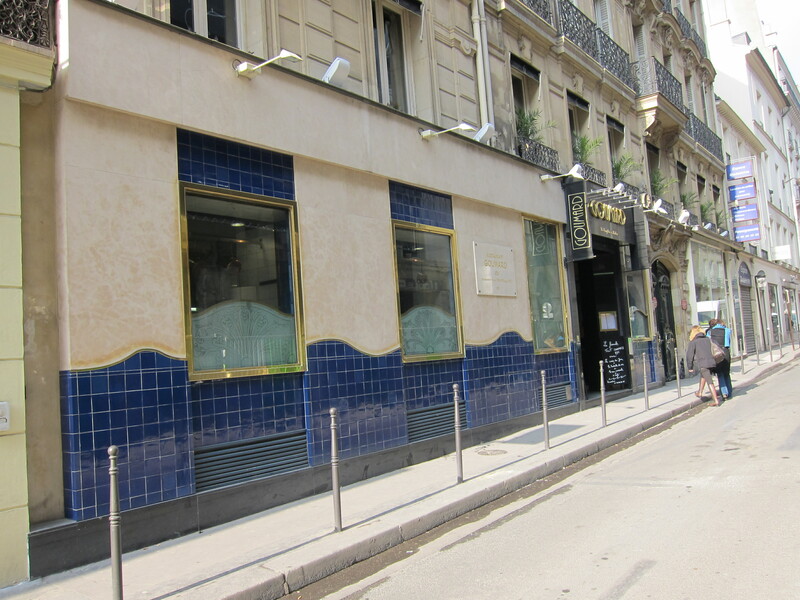 My trip to Paris in February 2010 included far finer dining than any of my visits before. Aiding and abetting my culinary extravaganza were two friends, Ted and Joby, whose time in Paris overlapped with mine. Even with guilt dogging me, nipping at my heels as I tramped across Paris in search of restaurants on my own or with my friends, I dedicated the hours outside of work to gustatory pleasure. Our first joint venture was to Goumard, a restaurant whose reputation rests on the chef’s handling of seafood. It is located on a street set at an oblique angle to the Madeleine. The guides claiamed it is one of the best of new restaurants. However, we felt it delivered less than what the food guides promised. The dominant primary color in upstairs dining room is purple. Nearly every other hue in the room deviated from that standard — lilac, mauve, burgundy — all highlighted by trimmings and piping of various shades of green. Men in suits outnumbered less formally dressed women. A bald, older man, with a fur-trimmed parka over the back of his chair, ate alone at a table in the center of the room. We each had as our entrée (or first course) a lobster risotto flavored with cilantro, parsley, and chives. The flavor that stood out — overwhelmed, even — was cilantro. The risotto tasted as though the chef had used the lightest of chicken broth. None of us could discern lobster, shrimp, or fish stock in the risotto, which, as far as we were concerned, constituted a serious flaw. It was not a rich risotto. Two of us thought it was much underseasoned. The Italians have a great word for food of this kind: insipido. The pan-seared roasted skate fish served on a mound of half-mashed herbed potatoes pleased us more than the first course. It was a unanimous opinion that the panna cotta, covered with a green tea cake and topped by a generous dollop of cream with a small scoop of lemon sorbet to the side, made us happiest. One detail stood out boldly against the pale background of our food. The butter. The server placed a small, square pat of butter on the table. Half the square tasted like ordinary saltless butter. The other half was dotted with herbs, it seemed. I spread some on a small piece of bread. When I bit into it, the flavor of butter mixed with the briny taste of freshly shucked oyster liquor jumped up alive in my mouth. If I had had a dish of oysters in front of me and mopped up the oyster broth with a piece of bread, the flavor would not have been more pronounced. Delicious. Unfortunately, we waited half an hour between our first course and the second. We protested to our server, who claimed the kitchen was backed up. We looked around us and saw others receiving their plates. An elegantly dressed and handsome man at the next table prepared to leave. As a tacit apology for the poor service, he passed us the remaining half of the bottle of Chablis he hadn’t finished. Suddenly we were made happy. In the end, we felt it was a good start. Not exciting, but a good standard against which to measure our upcoming meals.